A few years ago, I showed you the former Luby's, which as of this writing isn't updated yet (when it is, I'll do a quick update on this page to remove that disclaimer), which is where Eccell is located today. For a number of years, though, Café Eccell was located at the corner of Church Avenue and Wellborn, 101 Church Avenue. The building of Café Eccell, as plain and kind of ugly as it was, used to house the city's first city hall and jail back in the 1940s (built 1947). The city hall moved out in 1970 when a new building was built, and I'm not sure of what it was used for later (the police station was also in Northgate during those days, though not that building). The city held onto the lease and in 1989, it reopened as a restaurant, Café Eccell, which featured a classier, "adult" atmosphere and food that the rest of Northgate lacked, and still tends to lack today. The first incarnation of Café Eccell closed permanently in March 2014 a few months after its lease ran out (why the city never locked them out is unknown). The restaurant opened in 1989, and after changing of hands to the Dallis family completely around 1991, the restaurant continued for many years. The food was also plagued by inconsistency in its latter days as well as the drama involving the Dallis brothers (a.k.a. Eccell Group), the developers, and the community as a whole. A few months later the building was wrecked for The Domain at Northgate apartment building, which is only four stories, occupies the whole block, and includes retail opportunities, though only one is currently open (4.0 Cuts Barber Salon, opened spring 2016). 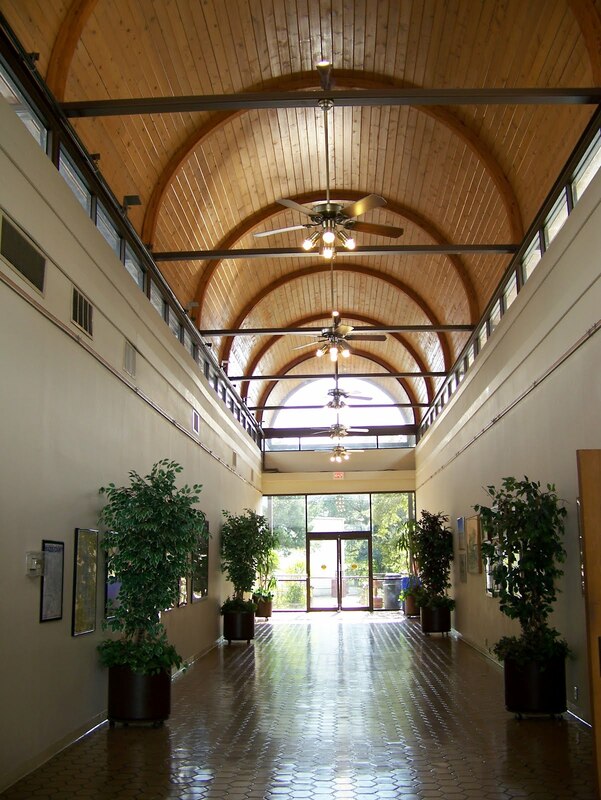 The building itself was ready in time for the fall 2015 move-in season, and for a time had a leasing office in the former Cycles Etc. on University Drive. Of course, the Domain was not the first development to try to redevelop CE, it was to house "Gameday Centers College Station" circa 2004, a large multi-story tower (about 7-8 stories). Gameday Centers was largely doomed to begin with: the company was building luxury condos for big-money donors to stay in on game weekends, but the asking price of $500,000 a condo was too much* (it would be a better value to buy a house in the Traditions subdivision, which is what many have done), negotiations with the city broke down, and rather than a first phase done by August 2007 and completion by December 2008*, it was canned. The center would've had 10,000 square feet of restaurant and retail space and had even signed a 10-year lease with Café Eccell as part of the agreement*. *Unfortunately, since this page was originally published, one of the links I had for this page has gone dead and I have been unable to relocate it, as the Batt link is dead and Archive.org does not have it. Likewise the links for the other links seem to be lost. Remember when I redid the Northgate page, and cut out all references to College Main? Well, those days are over, and this has now returned to this page. I personally despise the way College Main is set up these days: it used to be a normal road, with sidewalks, bike lanes, and two lanes. In summer 2012, while they made the part of College Main going up to Old College a lot prettier and functional (sidewalks, well-lit, bike lanes, etc. ), they turned College Main into a pedestrian mall, which doesn't get a lot more foot traffic, and history has shown that turning streets into pedestrian malls often kills them off instead of saving them. Oh well. However, since this College Main has mostly deteriorated into mostly bars, it probably does make more sense, in a way. Beginning as Court's University Shoe Repair in the 1930s or 1940s (an archival photo that I can't find right now), the current tenant history has this being vacant in 1993, being divided between a Lacey's (jewelry store) and "Perfect Tan III" by 1995 (there's also a photo of these two that I don't have up either). By the late 1990s, this was "Byte Me Computers" (according to a 1997-1998 plan of the Northgate Promenade, which showed nearby buildings). It became Antonio's Pizza by the Slice in the early part of the 2000s, which has decent and reasonably priced pizza. It also offers Coke products, something the university hasn't in a number of years. In the same building as Northgate Barber Shop, this used to be Software Exchange back in the mid-1990s and Julia's Silver Boutique around 1998. The 1972 directory says this was "Zubik Tailors". In 1989, this was "Custom Creations by Hullabaloo". For many years, Hookah Station was the location of Holick's boots. When Holick's moved out in the early 2000s (2002?) 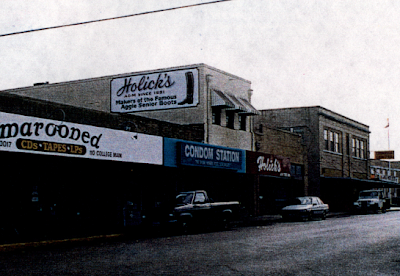 to Westgate Center, the painted "Holick's" on the side of the building remained. Unfortunately, Hookah Station trashed the building both in terms of historic qualities and physically. When it was sitting vacant and clearly falling apart, it somehow still looks better and classier than the pit that's there today. Holick's even had maroon-and-white awnings, a nice touch. This barbershop has been here for years (since at least the early 1970s!). In the late 2000s, there was "Northgate Barber Shop Too!" at Holleman and Anderson, but that has since renamed to "Maroon & White Barber Shop"
In the early 1980s, this was a store called The Drafting Board, an engineer's supply shop (reminder: there were less computers than today), and later became a restaurant called A&M Steak House by the late 1980s (hamburgers, apparently). After that was shortly another store, Condom Station (at the zenith of Northgate's decline). I'm not sure how long it lasted, but it wasn't long. 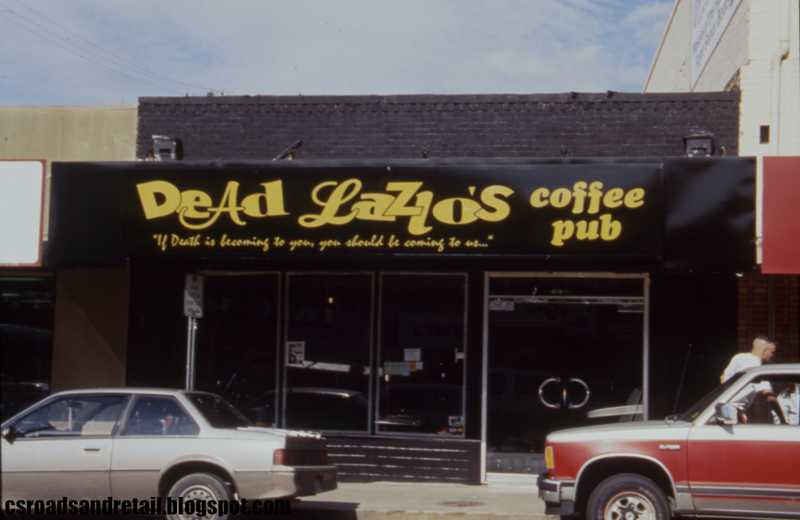 Copacetic (or Copasetic, I've seen it both ways) Café in 1998, and Foundation Room later (which has even more recently changed to "Foundation Lounge"), but not before briefly becoming a bar called Groove in the mid to late 2000s. The Foundation's current ƒ logo used to be a Comic Sans-esque "G". It should also be noted that the Drafting Board was formerly "News Office Supply", according to an old phone book. A 1972 directory mentions that this was White Auto Store at this spot. Sarge's moved here in the early 1980s. It used to be Aggieland Studio, which was a portrait studio like University Studio. 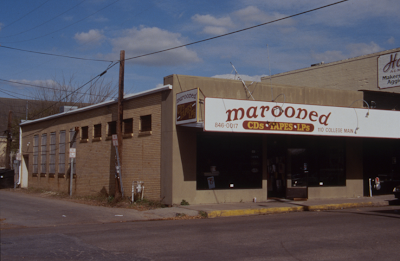 In 1989 this was a Chinese buffet called Taipei Express, and soon became a large record shop called Marooned, which remained throughout most of the 1990s. After Marooned was closed, by the early 2000s, it was a Quizno's, but that didn't last very long, and became V-Bar circa 2005-2006. In 2007, the V-Bar was embroiled in an attack that left a Rice Owl basketball player dead and his brother injured in which someone stabbed people during a bar fight. The media was very sympathetic to the brothers at first, but later on it was revealed that the attacker, a Marine, stabbed them in an attempt to get them to stop beating his fellow "Marine brother" to death. Compare the full story ("Ex-Marine not guilty ", March 11, 2010) to earlier reports. By the time Ronald Johnson was cleared of murder, the V-Bar was on its way out (if not already). It became Social Lounge, which it is still is now. The picture is from Project HOLD, which shows it as Marooned. The windows have since been bricked up. 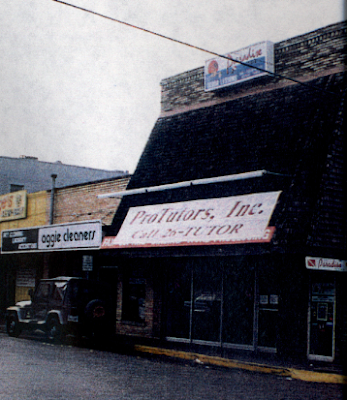 Despite a much older photo as evidence, a 1972 directory indicates that this was "University Shoe Repair" (not 104), which is also strange since it's one of the larger spaces on Northgate. Gatsby's space hasn't moved around much. 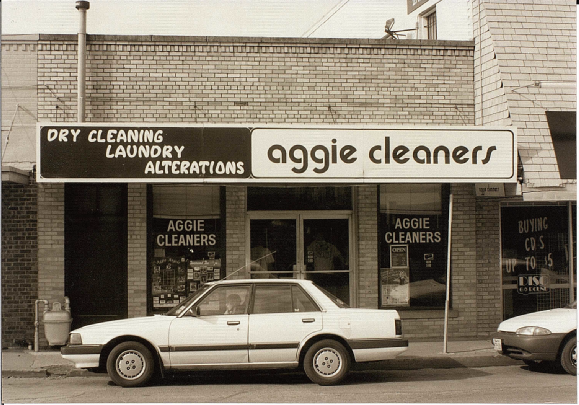 Thanks to its current sign, it says it's been there "Since 2004", and prior to that was Aggie Cleaners. Gatsby's is currently celebrating of being on College Main for 10 years, though Aggie Cleaners had stuck around for at least 30 before that. A non-existent address these days, but it was listed as "University Cleaners" (not to be confused with Aggie Cleaners). It would make sense if this shared the space with the new location of University Shoe Repair. This used to be Disc-Go-Round, another record store, and before that, ProTutors Incorporated. Records also mention that this was the first police station of College Station. Despite (what was then called) Kyoto Sushi's ramshackle appearance (sometime around fall 2012 or spring 2013 it stopped serving sushi entirely and is only open at night as a sake bar), it used to look even worse. In spring 2014, it changed to Kyoto Japanese. It's still a sake bar, but is a Korean restaurant called The Bulgori now during the daytime. Ironically, this still doesn't serve sushi--that's found over at Aggie Time to Go. Also worth noting that in the early 2010s, most of the building was painted yellow. This business isn't here anymore. There's an almost-gone "Aggieland Studio" mural on the side of the building. As you can see in the shot below (when the building looked even worse), there's a sign that says "Paradise" above it. That was Paradise Scuba. It moved to Parkway Square in the mid 1990s (soon after that picture was taken, my 1993 phone book still has Paradise Scuba as being in Northgate) and eventually moving to the old Putt-Putt location. 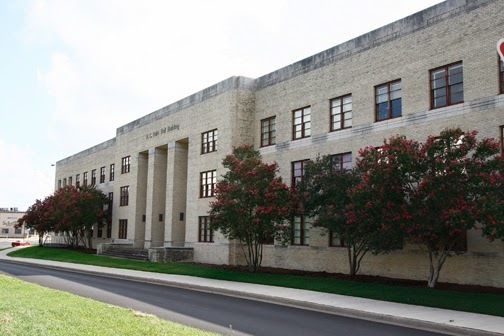 As of this writing, it looks like 115 College Main will cease to exist thanks to a recent New Development filing of 113 College Main renovating the second floor. In the late 1980s, it was the last home to On the Double (actually I think it was 113), after it moved out of the space above Farmer's Market. Last days of the original "Kyoto Sushi"
EDIT 4/6/14: The Bulgori is now closed (unknown status of AT2G) but the sake bar continues. I did eat there once. Decent food (got a menu! ), some good sides, soup included, even a slice of blood orange. Hopefully, I'll fill the rest in with pictures that are kicking around on my hard drive somewhere. Enjoy what's currently here for now, though! Leave comments if you can, especially on those businesses that I've inevitably missed. For more Northgate fun, click the link below to see all posts tagged with "Northgate". Another building bites the dust. 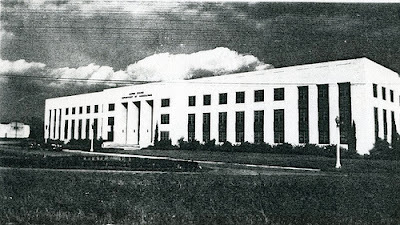 Built in 1942 as the USDA Building, this building survived just over 70 years before meeting the wrecking ball. While it was definitely a landmark at its prime location at University and Wellborn, it wasn't loved but still operated as classrooms and offices into fall 2013. While I did go in fall 2013, I didn't take any pictures (to my knowledge and eternal regret), but I enjoyed the "treats" I did find: the bathroom featured separate taps for hot and cold water. I'm not entirely sure of why they demolished Dulie Bell. It was old, to be certain, but it had gotten a fresh coat of paint and relatively new carpets, and given it was just replaced more parking, there was some serious problem with the building itself that was unable to be fixed without major investment, like plumbing, electrical, or foundation (Special Services Building was razed for that reason, and never utilized again until over a decade later when a basketball court was put there). Since the front of the building directly fronts the ramps to University and is difficult to get a picture of, I'll have to resort to other pictures. The top one was from the official map of TAMU, the bottom one is from Historic Aggieland. What a strange journey it's been for this post. I originally wrote this post way back in June 2011. After trying to bump it and the like, and realizing that were tons of errors, I figured "forget it" and removed it from the blog. But that was a while back, and I've had this in the "blog boneyard" for a bit. Then I posted it in fall of 2012, complete with a rewritten part with help from Grover Fugate, whose comment is reproduced here. But it still just wasn't that good, and I had to fill in for something. Furthermore, Fugate's comment was far out of date--this was the 1940s that he was referring to, and I just wanted to know more about when the crossing was closed. 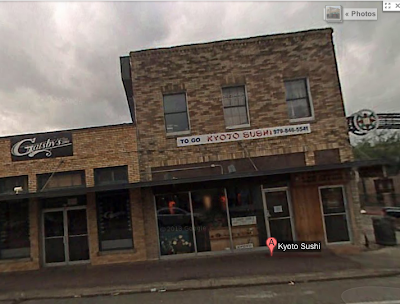 I also wanted to know more about the Chinese food place at the corner of Luther Street and Wellborn. What I saw on a 1940s architect's map was that the place where Twin City Mission resale shop is now was a place called "Hrdlicka Café" (which I really can't be sure if I'm pronouncing correct: is it "Herd-lick-ah?"). I updated it again in July 2013 but still found errors: specifically, how Amtrak wasn't accessed through Luther Street West, so we'll get to that later. For several months, I had a newspaper article on the closure of the crossing at Luther Street West and Wellborn, but removed it again. However, something interesting along the way, specifically how Henry Mayo wrote something for the official city blog on the same subject. It shed some more light on Hrdlicka's restaurant (the italicized paragraph below are from before this blog post came about), plus had a few other treats in store. The picture captions aren't italicized. Yes Luther extended over the railroad. That road led to the dump. Right across the railroad was a beer distributor on the left. On the right was a National Guard building. Right past the NG bldg was a place that made charcoal for a while. Maybe two hundred yards back was a pond that we played around as kids. You can get in touch with me via Anne Boykin. I would rather answer your questions via phone or a personal meeting. Ed Hrdlicka was my Grandfater. I lived in his house with my Mom and Dad. The house was right in front of the railroad crossing. Indeed, in the 1970s, there was a house there, owned by one Jack Fugate, at 801 Wellborn Road (it wasn't Wellborn Road then, it was Old Highway 6, but the addresses haven't been renumbered). Indeed, he married Marilyn Hrdlicka in 1943 and settled down to the "home place" in College Station, which was likely where her parents were (Jack grew up in Houston Heights). According to the obituary linked above (Jack passed away in 2005), he established "several businesses, including a printing company, a mom and pop store with a washateria next door". It was likely during this time that Hrdlicka Café became a small convenience store: the Piknik Pantry (marked as "2" on the map below). The laundromat and printing press listed were listed as "803 Luther" on the directory, and it was likely the building (also gone) that was behind the Piknik Pantry. At some point, the Piknik Pantry changed hands and started serving Chinese take-out as well. Piknik Pantry survived well into the 1990s even as Fish Richards and the other businesses of Fugate's disappeared from the corner. See below regarding "1", 803 Wellborn. 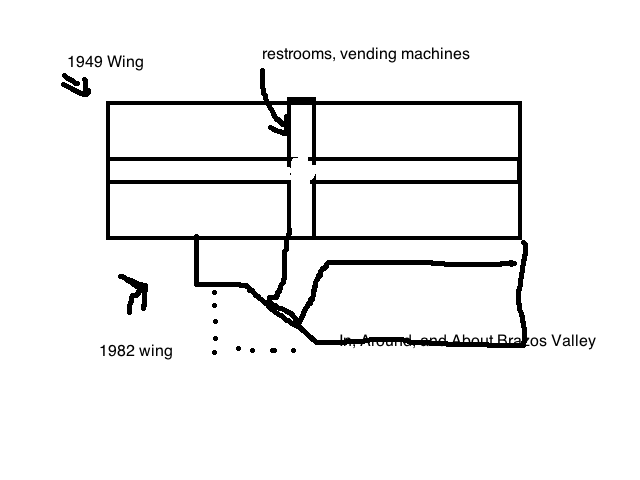 By the 1980s, the (now gone, unfortunately) house at the corner of Luther Street and Wellborn (labeled as "1" on the map) was converted into a restaurant. This was Fish Richards Half-Century House, serving a variety of good meats and good wines. Notice that I had mixed up 2 & 3...#3 is the convenience store. Piknik Pantry & Chinese Food (name confirmed from old phone books and directories) was where my dad picked up this for work several times, and it was (possibly) the first Chinese food I ever had. It probably wouldn't pass modern Brazos health inspections today, though. 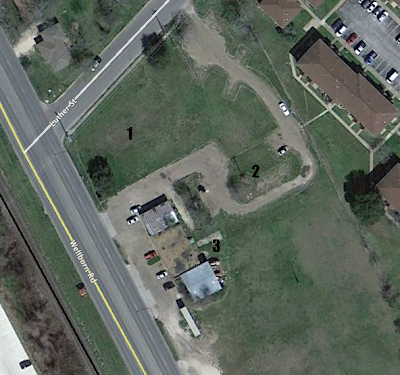 At some point prior to the 1990s, there was a dive bar in that area ("The Peanut Gallery"), just south of it. 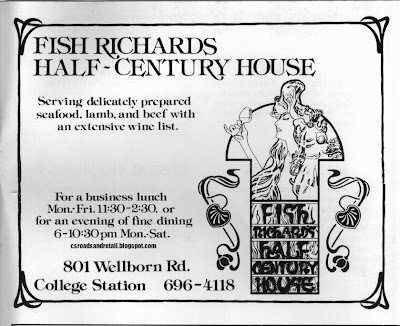 Apparently the reason that Fish Richard's closed was due to a divorce by the couple that owned it, but the building burned down soon after nonetheless (though some ads in the final days of FR's mention that Fish Richard's was looking for a new place). The other interesting aspect is that the Amoco station seen above was the Piknik Pantry and had a different facade at the time. Should I be surprised it had pumps at one time? Here's an update regarding the building 1, referred to 803 Wellborn even in 1980 (confusing, right?). What was once the printing press and laundromat was home to Fish Richards Bakery, which sold a variety of baked goods all day, every day (except Sunday afternoons). I read somewhere (but lost the source) that this was the original supplier for Subway when it came into town in the early 1980s. Ad can be found here. Feel to free to leave comments on anything related in this post. 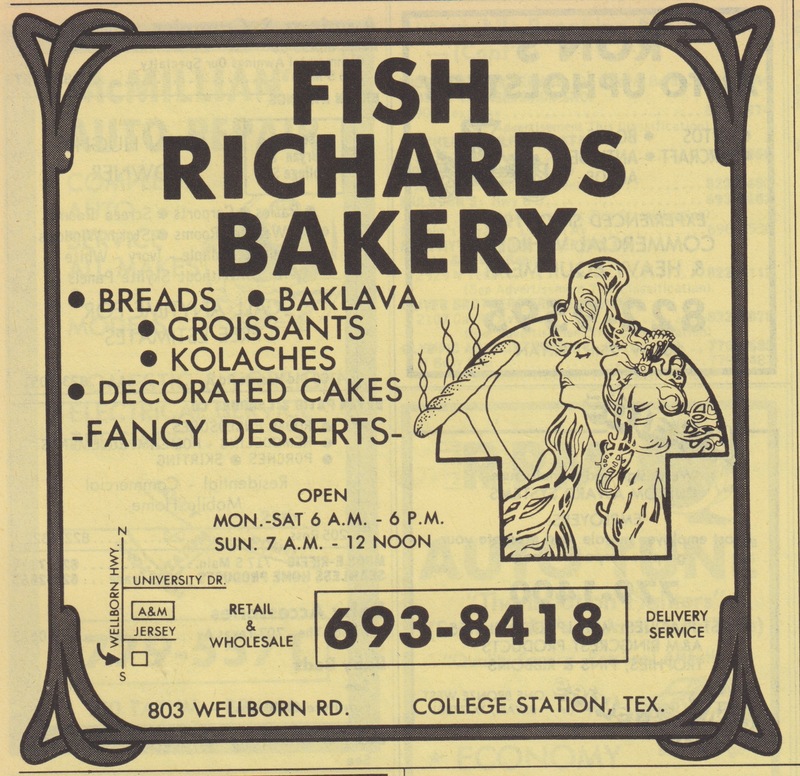 Updated June 2014 with additional information about Fish Richard's and the bakery. Yesterday (from when this post was made), College Station Conference Center was shut down...basically condemned due to concerns that the roof would collapse. And to me, that may be "well, it was old and needed to be torn down anyway for a more modern building", but to me it was kind of special. For starters, it had the first permanent building off campus for the CSISD, holding first through 12th grade, built in ~1949. The high school would move out in the 1950s or 1960s and again in the 1970s (the latter building will be explored in a new post coming soon). 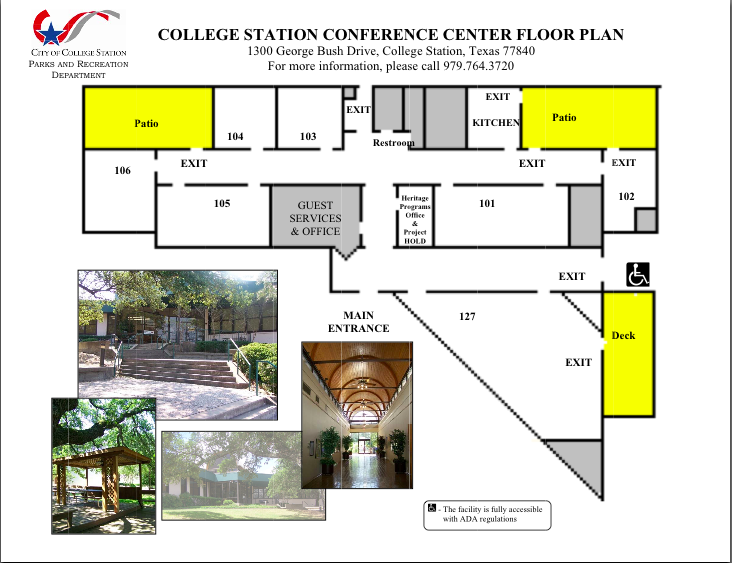 It also had a green triangular overhang and a newer very 1980s wing built in front of it (which was there at the opening of the Conference Center in 1982), plus it was one of the few areas to use the "old" College Station logo, which has been excised practically everywhere else. It used to be on the water tanks, even in the pool at Southwood. Additionally, in the 1949 wing, it had wooden floors (carpeted) which was great: it gave the floor a nice spongy, comfortable feeling not found in newer buildings (the last major wood-floor building on campus, for instance, was Special Services Building). And more importantly, there I was volunteering at Project HOLD, which sadly eliminated its full time job position not too long after I worked here. In 2010, I tried to get a volunteer job there, as I had done last year. Regrettably, they could not accept me, so I did the next thing: create my own archives. Do my own research. And publish what I found in an easy to view, easy to access format. This website that you're looking at, Brazos Buildings & Businesses, hosting on csroadsandretail.blogspot.com or possibly carbon-izer.com, is the result of that. Here's another picture of the Conference Center (the newer wing), from the same Flickr page as the image on the top of the page came from. As you can see, it's solidly early 1980s. I do miss those hexagonal tiles, though. Anyway, in late 2012 or early 2013 it was announced that the building would not reopen, and instead it was demolished for College View Alternative School, hosting both Venture and Timber Academy. Updated Nov/15 to merge updates and update something else.